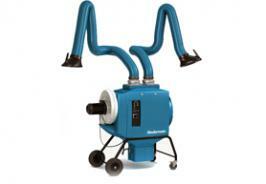 Mobile dust collectors from Envirox include portable dust collectors and a range of accessories, all ideal for capturing and eliminating welding fumes and dust from your industrial or hygiene-sensitive workplace. Mobile dust collectors combine the latest state of the art technology with user friendly design and function to allow your workspace to be as efficient as possible. You can move these highly effective pieces of equipment to where they are needed most within your work environment in order to get the job done as quickly and easily as possible. 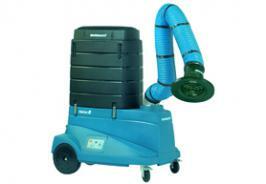 Mobile dust collectors ensure the utmost standard of hygiene is maintained in a workspace by powerfully extracting potentially harmful fumes, smoke, and dust, keeping your employees safe and healthy. Plus, many other technologically advanced features across the range. Extraction arms with a spotlight to ensure you’re able to place your unit exactly where it is needed. A warning signal when the filter is full. operator health and safety which results in an end product quality of a superior standard through improved, cleaner working conditions. Contact us to find out more or choose the right solution for your workspace.